Source: Mike Adams "Health Ranger"
Fact is, we are a nation of drug addicts. We drug ourselves, our elderly and our children on a daily basis. We do it with prescription medications, over-the-counter pills, alcohol, caffeine, nicotine... and we say it's all fine because those drugs are legal. But wait a minute, you say. Those legal drugs are different from marijuana. They're FDA-approved drugs, prescribed by a doctor. They have a medical purpose. So what's the real difference between legal drugs and illegal drugs? Some people think that only illegal drugs are habit-forming. Yet legal drugs can be just as addictive as illegal drugs. Just ask anyone who has tried to quit smoking, go off caffeine, or kick to Oxycontin habit. So is there some other difference between illegal drugs and legal drugs? People argue that legal drugs are safe. They're FDA-approved! And yet they fail to recognize that prescription drugs kill more Americans each year than all the crack, meth, and heroin deaths combined. Let me put this another way. You know why cigarettes are still legal? Consider this: here's a product that admittedly kills people. It has no health benefit whatsoever. It is a threat to the public health. Yet why does it remain legal? Because states get a cut of cigarette sales thanks to the Big Tobacco settlement a few years back. Keeping cigarettes legal results in desperately-needed revenues for states... revenues that are almost never spent on anti-smoking campaigns, by the way. It's a classic racket: tobacco is allowed to remain legal because powerful institutions get a cut of the action. While people die from lung cancer, states get financial resuscitation by taking a cut of every sale. States are trading your health for their revenues. Sometimes the exact same chemical is both legal and illegal, depending on who profits from it. The FDA, for example, banned the Chinese herb ma huang because it contains ephedra. Yet the exact same chemical compound remains perfectly legal in over-the-counter drugs like Sudafed and a variety of cold medicines. Sudafed even gets its name from ephedra: "pseudo-ephedrine." So why is ephedrine illegal in herbs, yet legal in pharmacy drugs manufactured by drug companies? You already know the answer. That's why medical marijuana is illegal: because government doesn't control its distribution, nor does government receive a financial cut. You can bet your life that if Big Pharma owned the patents on medical marijuana and could set monopolistic prices on it, pot would be perfectly legal to own and smoke. That is, as long as you got it from a pharmacy where prices and distribution could be controlled. Control is the key here. You think the FDA is discrediting drugs from Canada in order to protect your health? Get real. The FDA is simply protecting the monopoly drug market in this country. It's controlling distribution points in the U.S. in the same way that a crack dealer assassinates his street corner competition. Eliminate the competition, and you can set whatever price you want. That's why uninformed U.S. consumers pay 30,000% markup prices for drugs that can be acquired in Mexico or Canada for pennies on the dollar. You see, corporate America doesn't really care what you put in your mouth, up your nose, through your lungs or into your veins, as long as they get a cut from it. That's the whole prescription drug racket in a nutshell: it's billions of dollars in annual profits generated from mind-altering (yet legal) drugs that flat-out kill people. Lots of people. Like 100,000 Americans a year (or a lot more if you believe more critical statistics). So if you've ever wondered why Ritalin -- which has no medical purpose whatsoever -- is perfectly legal, and yet medical marijuana -- which has a well-proven medical purpose -- is outlawed, now you know the answer: because Ritalin makes powerful people rich. And marijuana doesn't. Anybody can grow marijuana. Drug companies don't control the patents. Now, just for the record, I do not personally use any drugs whatsoever (recreational, over-the-counter, prescription or otherwise), and in fact, I teach people to be 100% free of all drugs, including caffeine and alcohol. I bought into the "just say no to drugs" advice of Nancy Reagan, and I actually applied it to ALL drugs, not just selective drugs. And as far as I can tell, aside from the Mormons and the Amish, there are only a small percentage of truly drug-free people living in this country. Practically everybody I meet is addicted to at least one of the following: coffee, cigarettes, alcohol, pain meds, prescription drugs or sugar (which alters brain chemistry in drug-like fashion). Where is this War on Drugs when it comes to Grandma in the nursing home, who died of a stroke caused by Cox-2 inhibitor drugs? Where is the War on Drugs when little Johnny schoolboy picks up a rifle and blows away his classmates because he's on antidepressants and can't tell the difference between real life and a first-person-shooter video game? Where is the War on Drugs when 16,500 people each year die, shitting digested blood until they pass out and die because that daily dose of aspirin tore a gaping hole in their stomach? The War on Drugs, you see, turns a blind eye to the death and suffering caused by these drugs. The DEA pretends prescription drugs don't even exist. No prescription drug death has ever been prevented by the DEA as far as I know. 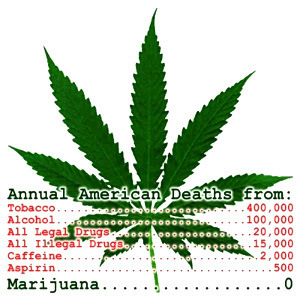 Yet 100,000 Americans are killed each year by FDA-approved drugs. The DEA has no interest whatsoever in protecting Americans from these drugs. Ever wonder why? Labels: "war on drugs" "mike adams" "natural news" "health ranger" "marijuana" "legalization" "cannabis" "prescription" "drugs" "prohibition" "2012"